Foodservice Equipment and Supplies magazine recently selected Chefs’ Toys as Top Dealer Achiever for 2016. Steve Dickler exemplified the forward-thinking, collaborative style that effectively elevates the entire channel in today’s challenging foodservice environment. Chefs’ Toys, the leading restaurant equipment and supplies company in southern California, announced today that Foodservice Equipment & Supplies (FE&S) magazine selected Chefs’ Toys' President Steve Dickler for the 2016 Top Achiever - Dealer award. FE&S is the leading media source connecting equipment and supplies manufacturers and service providers with the full distribution channel, including foodservice operations, equipment dealers and consultants. “Getting recognition from FE&S magazine, one of the leading media sources in our industry, is quite the honor,” says Steve Dickler, President of Chefs’ Toys. “There are so many great dealers in the U.S., so getting this award means a lot. We are so thankful.” Chefs’ Toys also placed 25 in the magazine’s 2016 Distribution Giants study, which names the top 100 foodservice equipment and supplies dealers by sales volume. FE&S' presents its Dealer of the Year and All-Industry Gala Awards, honoring the foodservice community's best and brightest, annually on a Saturday during the National Restaurant Show. Chefs’ Toys will be attending the Gala. The NRA Show is being held at McCormick Place in Chicago, Ill., and runs from May 21-May 24, 2016. A profile on Steve ran in a recent issue of FE&S. You can find that here. 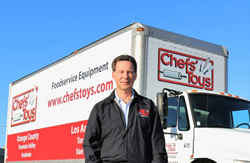 Chefs’ Toys, with its start in 1988, is the leader in restaurant equipment and commercial kitchen supplies in the southern California marketplace. With a design division and 20 commercial trucks, Chefs’ Toys offers 6 consistently designed superstores in southern California, as well as a large distribution center. Offering over 9,000 products and supplies, with excellent relationships with the top brands in the restaurant space, and knowledgeable employees including trained chefs, Chefs’ Toys is well positioned to continue to provide commercial equipment, professional products, services and supplies to the foodservice industry. Chefs’ Toys Orange County/Inland Empire locations include Anaheim, Fountain Valley, and Corona, with its 7th store opening this summer in San Diego. Its Los Angeles area locations include Torrance, Van Nuys, and West Los Angeles. Chefs’ Toys also offers full professional services including design, planning, consulting, and project management services for restaurants, bars, and commercial kitchens. Learn more at http://www.chefstoys.com.